After all of those hugs we walked over to the lawn for the group shots. 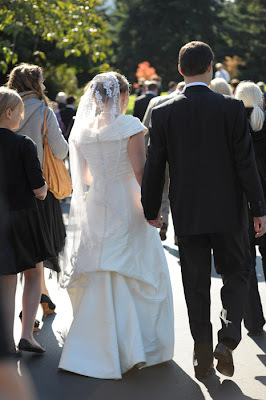 What is it about walking photos that makes brides love them so much? 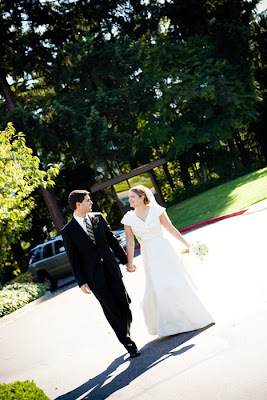 This shot even has some random car in the background and it is still one of my favorite wedding shots. One thing I didn't do was get some shots of the back of my dress during portrait session. 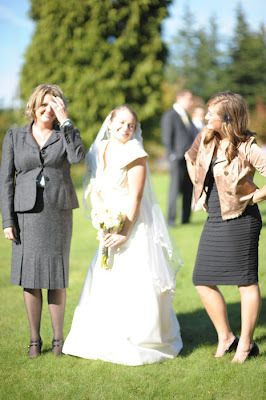 So sad when you think about how much I love my mom's veil and my bustle. Group shots are so boring. I realize they are an opportunity to catalogue who was present, but they're just boring. Luckily they didn't take very long because we only took 6. 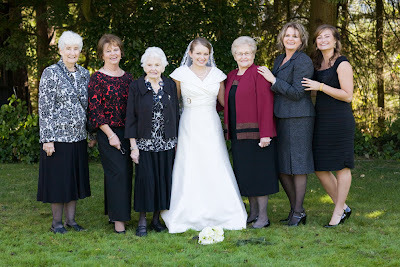 The full group, anyone related to either of us, my mom's side, my dad's side, me and my grandparents, and me and my grandmas. The only shot I regret not taking is one with just That Groom and his family/guests. This is what group shots are like. 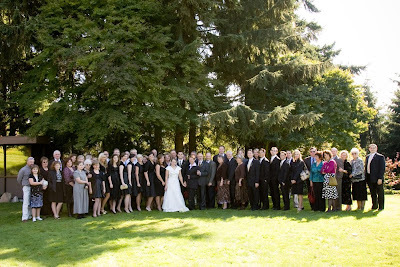 The photographer attempting to get everyone in place, everyone talking to someone 5 people away from them, and the people in the back row blending in with the trees because the ladies in front can't be squatting in their dresses. What is my sister doing? I have no idea. But at the time I found it to be absolutely hilarious! 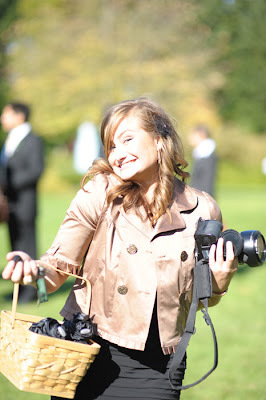 In my last post I mentioned that my bouquet was trashed, and this picture illustrates why. Anytime I needed to be putting my arms around someone for a photo I just tossed it on the ground in front of me. Bad bride. 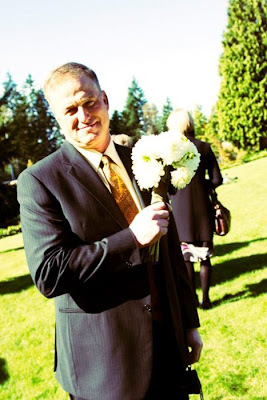 Sorry dad, even your tender loving care can't save that bouquet from a sad and lonely death. I saw MOH Shay walking around with the umbrellas I had stockpiled in case of rain. We obviously wouldn't be needing them for the guests, but I couldn't just let them be a complete waste and so I called her over for a little mini photo shoot. This turned out to be the only time we did something that involved just the two of us the entire day. I think it is one of her favorite memories as well. An attempt at some Rodney Smith style shots. This is what I like to think of as the "spice" we added to the group portrait time. My mom, sister, and I all happened to be waiting around together while some other shots were being taken so we capitalized on the chance to be our silly selves for just a moment. Of course, being the busy bride the shots really did last just a moment. The last thing That Groom and I did on temple grounds was capture what I like to call the "iconic LDS wedding day portraits." 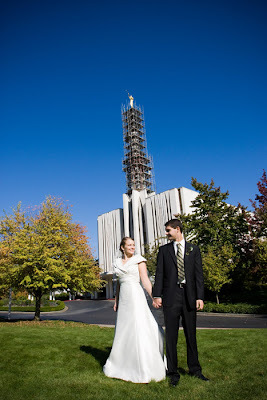 I'm not joking, all LDS brides and grooms have pictures just like this on their wedding day. I really wish my shots didn't involve that big ugly scaffold on the steeple. I might try and photoshop the scaffold out, and I might not. It was part of my wedding day after all. What would you do? Would you take the scaffold out or leave it in? Or you could try revisiting outside the temple when the contruction is done and restage the picture. That'd be kinda neat. I love the umbrella pictures. Kinda flashback to Mary Poppins. I love the classic LDS picture! 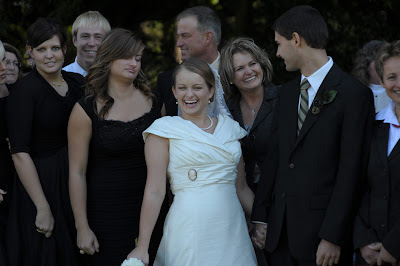 I grew up with a girl whose family is LDS, and three of the sisters have gotten married within a year of each other and every single one of them has a picture like this. It's very cute. You and your sister are too cute! I'd say try taking out the scaffold, and you can see how you feel about it :) Your whole wedding day seems just... fantastic. I vote for taking the scaffolding out...shouldn't be too hard. No harm in seeing what it looks like and if you like it better! I never would have noticed the scaffold if you hadn't pointed it out... I guess I just mistook is for part of the design! I commented on this post on weddingbee (I read you on both! 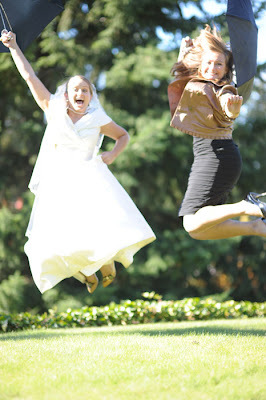 ), but I'll say it again: I love your mom & sis hamming it up for the camera. And, as for photoshop, I believe on weddingbee, I said to photoshop it out. After thinking about it - I'd say do what your heart (or maybe your gut) tells you. I can see the charm of leaving the scaffolding up! I would leave the scafoldding in for the album etc, but if you want to frame one to have on a wall in your house, I'd photoshop it out. 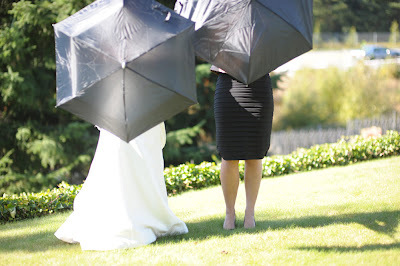 LOVE the umbrella shots. And frankly, your bouquet did an amazing job - it looked beautiful - got you through what it needed to, AND has given you lots of memories as it slowly faded. A well earned proud death of a bouquet. :) Was that too morbid? Oh, and btw - the guest photo might have been a little boring and not turned out perfectly, but we've been to 1 wedding where they did a guest photo and while it didnt turn out either, as a guest it was a thrill to be included. 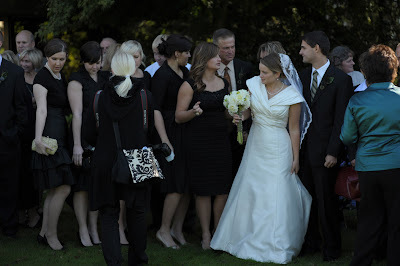 We were good friends but not in the wedding party so we felt so loved and included to be asked to be in a group photo.